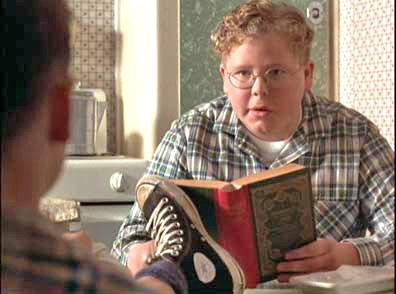 Gregory Smith, Stephen McHattie, Seth Smith, and Oliver Hodges wear black high top Converse “Chuck Taylor” All Stars in the film. Danny becomes friends with the cantankerous Mr. Langer after accidentally shooting him with an arrow. Set in suburban Baltimore in the spring of 1959, The Climb is the story of Danny Hines (Gregory Smith), a athletic twelve-year-old kid who is obsessed with proving his bravery. The main reason for this is the fact that his widower dad Earl (David Straithairn), didn’t serve in World War II or the Korean War, and everyone in the neighborhood thinks that he was a draft dodger. Earl’s uncertain past seems to cloud everything that Danny does. Two neighborhood bullies Andy and Tommy Sweeney (Seth Smith and Oliver Hodges) pick on him because they think he is a coward (like his dad), and Danny also wants to prove he is as capable as his sharp-tongued, intellectual older sister, Leslie (Marla Sokoloff). A typical event in Danny’s life occurs when he wants to play on the neighborhood little league baseball team, and there has to be a meeting about it. Leading the opposition is Jack McLaglin (Stephen McHattie), a decorated war veteran with a lot of baggage from the war, who riles up the neighborhood by firing his rifle at all hours of the night. Even Danny’s best friend Wayne’s (Matthew Ness) dad was killed in the war, and although he was considered a hero, it doesn’t provide much consolation to Wayne, who wishes he had an alive father like Danny does. Most of the neighbors have a good opinion of Earl, yet take advantage of his subordinate station in the post-war 1950’s society when dirty work has to be done. All the neighbors have signed a petition to make Jack stop firing his rifle, but when it comes to delivering it to Jack, they leave the job to Earl. 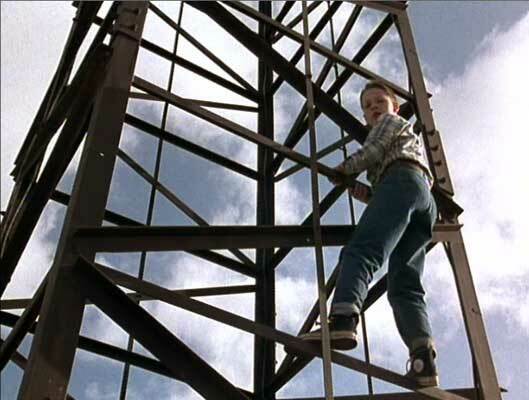 To prove his bravery, Danny wants to be the first boy in the neighborhood to climb a rickety old radio tower over 200 feet tall that overlooks their neighborhood and is scheduled to be torn down soon. The Sweeney’s have turned climbing the tower into a macho challenge, and no one is allowed to try the climb until the day before it is torn down. Danny and his best friend, Wayne, discuss climbing the tower. Things would be complicated enough for Danny without two additional things that change his life. While practicing archery with Wayne, he accidentally wounds Chuck Langer (John Hurt), the cranky father of their neighbors, Ruth and Ed Langer (Sarah Buxton and Michael Saccente) with an arrow. Mr. Langer is dying of lung cancer, and has come home to his daughter’s house to spend his final days. 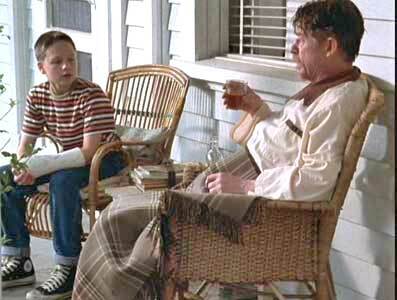 Because Danny injured Mr. Langer, he feels some obligation to him, and soon he is spending time with him, helping him survive the pain by bringing him whiskey and keeping him company. Langer’s moods often range from despair to wicked delight in the neighborhood gossip relayed by Danny. But Danny refuses to bring him a gun, when Langer tells him that he wants to kill himself. The second complication occurs for Danny after he and Wayne pull a prank on the Sweeney’s to get even for their bullying. 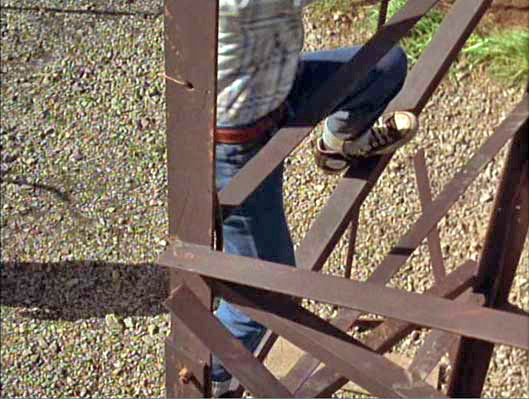 Danny is chased onto the roof of his house, and falls off, breaking his arm. So he doesn’t know how he will be able to make the big climb on the appointed day. When Danny confides in Langer about his desire to climb the tower, he is surprised to find out that Mr. Langer was a civil engineer and served in Army Intelligence. Langer decides to help him solve the problem by using his knowledge of engineering to rig up a cleverly designed pulley system that uses weights and gravity to pull him to the top of the tower. There are other complications that arise for Danny as he accidentally stumbles onto secrets in the Langer household on the same day of the big climb. How all of these plot elements are resolved makes up the balance of the film. 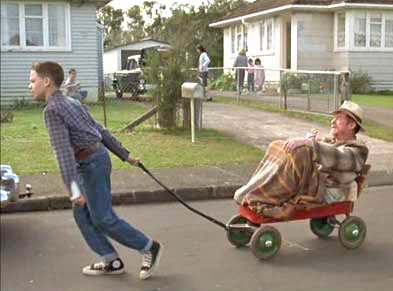 Danny has to transport Mr. Langer by wagon to survey the utility tower. It’s a shame that The Climb didn’t receive the promotion and distribution in American theaters it deserved, because it is well written, superbly cast and acted, and has appeal to all ages. The film works because the characters are believable and ring true. You really feel that the time you spent to watch it was well worth it when the film is over. Even when it presenting the inevitable coming of age messages, they are well crafted into the story line so they are easy to take. John Hurt, Gregory Smith, and David Strathairn deliver great performances in the film, and even though they represent different generations and very different types of characters, you feel empathy for all of them because screenwriter Vince McKewin allows each of the main characters adequate time to be explored in depth and be better understood as the plot unfolds. Director Bob Swaim has created a gem that deserves better recognition than it has received to date. For example, The Climb would be an excellent movie for television, certainly worthy of a prime Sunday night slot sometime. 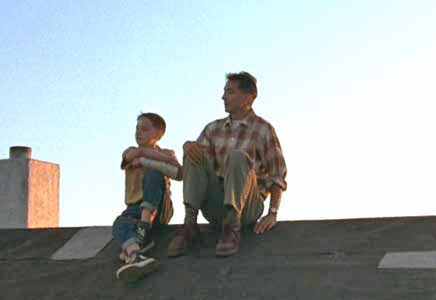 Danny and his father survey their Baltimore neighborhood. 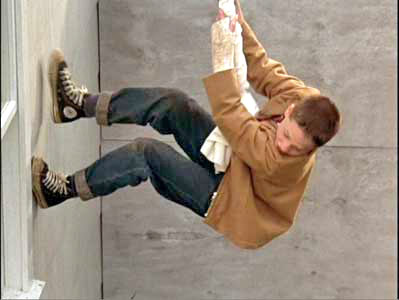 Danny climbs down the wall of his house to get to the tower climbing challenge. 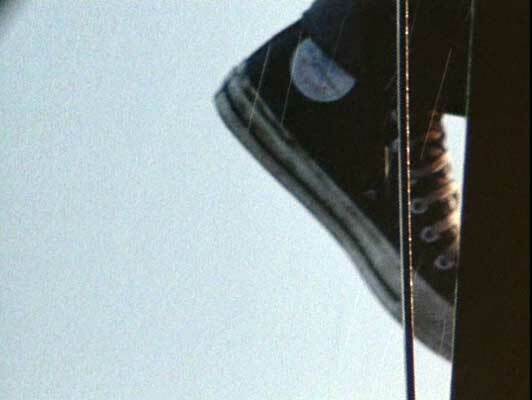 The main four kid characters appearing in The Climb all wear high top black chucks throughout the film, and the cinemaphotography presents you with a lot of good shots as a result. 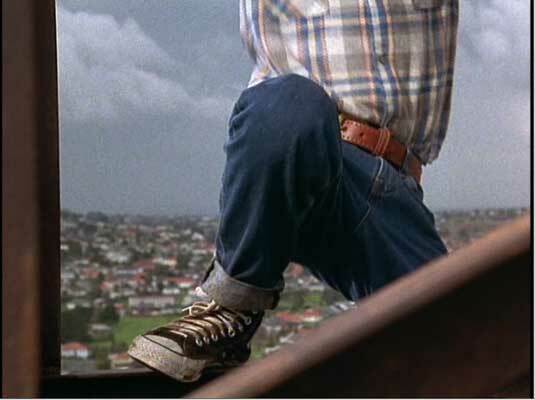 The best sequence of shots though are the two climbing scenes which focus your eyes on Smith climbing the formidable tower with nothing but his courage and black hightop chucks to help him do it. 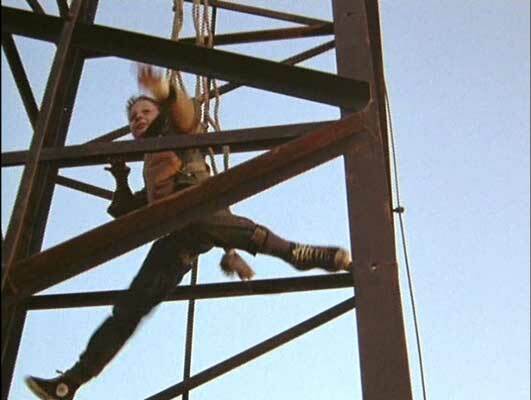 Shots of Danny climbing the huge metal utility tower. Click on the thumbnails to see the larger jpeg images. The Climb. (1997) John Hurt, Gregory Smith, David Strathairn, Stephen McHattie, Seth Smith, Sarah Buxton, Marla Sokoloff, Oliver Hodges.